Just after Christmas our little 6 month old heifer, Hotblack, surprised us all by coming in season. Not expecting her to be ready to procreate, she was still suckling from Mum! 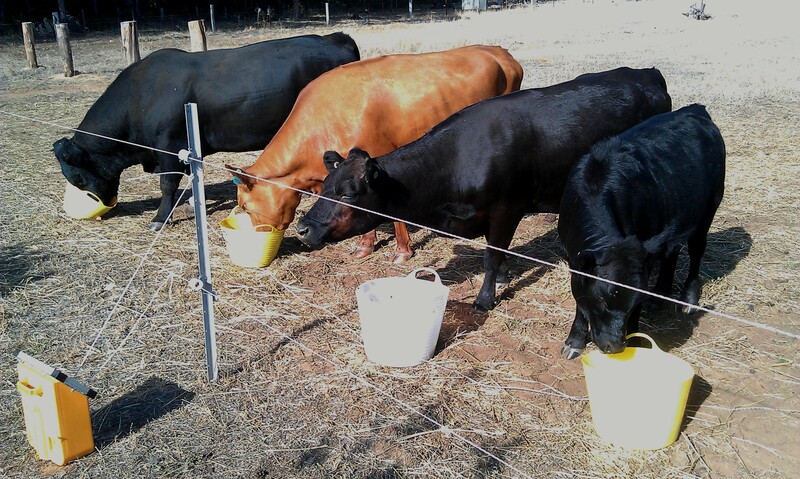 Taken in January – from left to right, Dougall the bull, Butterfly, Dora (Hotblack’s dam) and Hotblack. The bull that we had here, Dougall McBrave, was particularly interested. He is also her father. We separated her from the others with her mate G-Zeus the steer for company. Girlfriend bellowed her little lungs out. A few days in isolation from the bull, season over, and back with the herd. Three weeks later, I also separated her again as she came back in heat, keeping her away from that testosterone driven bloke. Turns out, I was too late, and he had got to her, sometime mid January. She was the only one of the lot that we had seen him interested in! So I was wondering if he was even doing his job. But given that three calves arrived in September, looks like he sorted out the rest of the girls shortly after his arrival. These three all arrived without trouble or assistance from me or the vet – including Fig’s first calf. Dora and Butterfly have both had several so I was not expecting any problems from them. 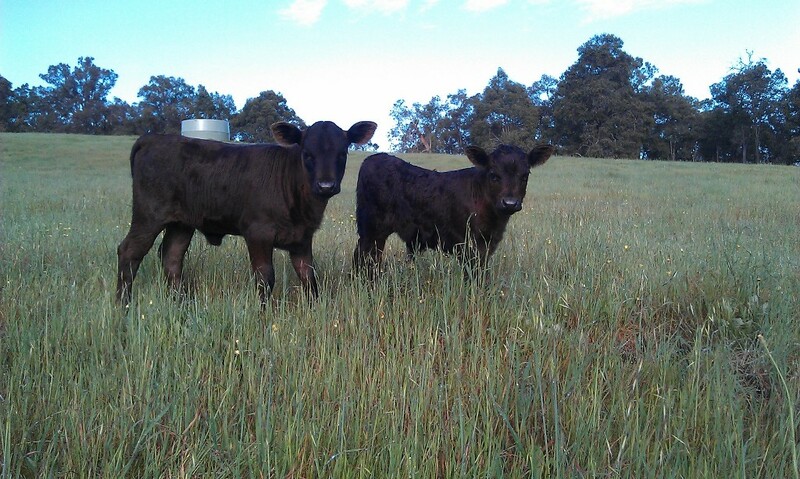 The next two calves – a bull calf from Fig on the right, and a heifer from Dora. After watching Hotblack carefully through February and March, and not seeing her back in season, I spoke to the vet, and I was trying to decide whether or not to let her go through with the pregnancy. The alternative is that she would have gotten an injection to terminate the calf, and this comes with its own risks. After speaking to a couple of other breeders, who had dexter heifers pregnant at the same age or younger, and successfully calve, I decided to let her go through with it, and trust that nature would not let her get pregnant if she couldn’t handle it. Now, at 16 months (and 9 months preggers) she is as big as her Mum – who is only a relatively small cow anyway. Knowing that we would be expecting her to calve mid October, I’ve been keeping a pretty good eye on her. About a week ago she started to ‘bag up’ – her udder filling ready for the impending arrival. Today I went to check on them, and the cows were in a weird spot, where they do not usually hang out. Once I stopped the ute and walked into the bracken fern and bush, Dora started mooing to warn of my approach. Hotblack was up, down, up down, and I got in close enough to see that the sac was already hanging out! She was on the way. A quick trip up the hill to phone the vet and put them on standby, and find out what I should expect and how much time she might have before I should be worrying. They said two to three hours and I should be seeing a calf. So off I go to keep an eye on her. Blasted thing is now hiding in the bush somewhere, and the other cows are down by the fence near the shed thinking they are getting fed. The three cheeky little calves were through the fence and in the garlic patch, so after shooing them out and switching the electric fence back on, I went off to look for her, carrying a bucket with a little bit of lucerne and molasses in. Now in remnant jarrah forest, along a creekline, full of bracken damn near head height, there are several hundred bits of black stumps or fallen trees that look like a little black dexter. Many false alerts later – and over an hour of trudging through wet undergrowth with now soaking wet boots, still looking for the blasted thing, I needed a better plan. Off back to the other cows, I thought if I lead them on a bucket (easy) that they might reveal her new hidey hole. So I did just that, leading them in towards where I last saw Hotblack. Got to a certain point along the creekline and they let out a few warning moooooos, and I knew I was close. So I slunk off into the bush to watch them and stalk them. Sure enough, they led me right to her. By now she is fairly puffing and panting, and down on the ground. I watched for a bit and she let me approach her and give her a scratch behind the ears. I really don’t think she was caring much by now who was scratching her where. 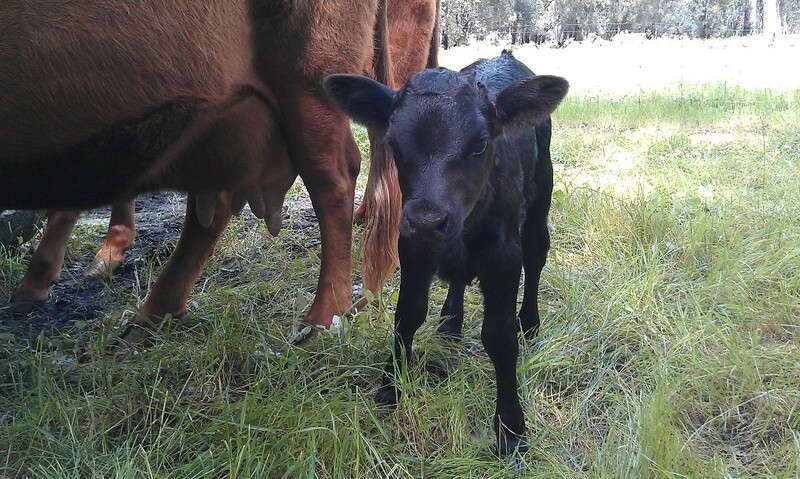 As I have never actually been present at the birth of a calf before I did not know first hand what to expect. I remembered reading in one of Pat Coleby’s books, I think it was, about feeling for hooves and which way the hooves were facing. Seeing as at this point Hotblack appeared to be beyond caring, down on the ground, puffing and panting and making little straining groans, it was off with the watch, up with the sleeves, and have a feel. I’ve never stuck my hand up a cow before either, so its a pretty odd thing to do. But I really wanted to know if the calf was facing the right way. About a full handspan in I found the first hoof, thank heavens, pointing the right way (down towards the ground) and the second hoof was tucked a little further back. I managed to wiggle the slippery little second foot forward a bit to be closer to the front one. Then watch and wait. The next thing to appear was a little wiggly calf tongue! By now she is really giving it the old heave, getting a little bit more vocal with every contraction. But nothing is moving really. A few more contractions and what felt like an hour but was probably only fifteen minutes and I thought, thats it, get the vet. Back in the ute, up the hill, call the vet – he’s out on another callout. The lovely receptionist relayed me messages of what to do and expect, but by now I am certain that the little guy is getting a bit stuck. Give direction to property to the vet receptionist. Back to cow. No progress. She’s still straining, puffing, panting, I swear she’s even crying if that is possible. Back in the ute, up the hill, phone the vet. Phew, he’s back and is on his way. Back to cow. Reassure her that the nice man is coming to help and he will know what to do, just hang in there honey. Back to other end of cow. Still one hoof and a nose and a purple sticky outy floppy tongue. Don’t think that looked particularly good, but hey, I am no expert. Have a feel – the other hoof is still a little way back, and getting harder to pull forward. Push calf’s nose back in a little to make room for the hoof. Start praying to any blooming deity I can muster the name of to help her through this, then off back down to the shed to bring the vet in to the labour suite (under a tree) once he got there. I must say, the Donnybrook vet is currently my favourite person on the planet. Super-vet powers on in, hero cape flying, quick assessment – he agreed with me that it was not looking good for the stuck calf with the purple tongue. Gives poor ol’ Hotblack an epidural to stop her straining, then try to attach the chains around the calf to pull it. Attach pulleys to tree. Push calf back down a bit. (liberal splashes from 4 litre drum of lubricant) Head chain on. Front hoof chain on. Try to get back hoof chain on, and HB decides now is a good time to get up and go for a walk. I think at this point the vet said something along the lines of “Its all turning pear shaped rather quickly” He is walking along behind her still one hand ‘in’ trying to get the third chain on the last hoof. I get around in front, slow her down, and eventually she sits back down for a rest. Off to fetch the vets bags and buckets and ropes and pulleys from where we had just set them up. We re-set them up on the trees where she is now – in a much better position to deliver a bub too this time. Chains on, pulley on, I slowly pull on the rope attached to the pulleys, under the vet’s directions, and the boofiest headed little bull calf head slides on out. Another gentle pull on the rope and the rest of him follows. Completely suprising me, because I was expecting lights out for the calf, he’s moving a bit, but he’s still not out of the woods. Tough little things really to go through all of that and come out wriggling. So the vet holds him upside down and I give his chest a vigourous rub to get the fluid out. Then we put him down just in front of HB’s nose so she can smell him. She gets a couple more injections to help her. I get instructions to let them be for an hour, then see if she has gotten up, and try and get her up and about. Vet takes off. A bit over an hour later, she wasn’t up, and neither was the calf. I got her a bit of lucerne chaff with molasses on, thinking she might like the energy boost. The calf is also trying to get up but not having a good time of it. HB tucks into the lucerne in the seated position. Boofa calf flops about. I flop him under her nose and she starts licking him. He starts suckling on my finger, then on any part of his mum he can get hold of. Mostly her ears and her eyes! Then she decides to get up and lick him. This is good. Very good. One back leg of hers seems to have gone to sleep and she’s a bit staggery for the first few minutes. Calf still can’t get up. He keeps falling over. Looks like his little front fetlocks won’t straighten out enough. So I try to see if they can straighten, and boy, they are very tight. But gentle flexing and a little help with balancing when he next tries to get up, and they are out enough to prop him up even though he is wobbling like buggery, and then he manages to take a couple of wobbly steps – on his tippy toes because those tight tendons won’t let his fetlocks straighten like they should. Eventually he manages to stay up long enough under the barrage of licks from Mum, to find a teat and start suckling. At this point I watch him for a few seconds, see him wiggling his tail and obviously gulping down that colostrum, and leave them to it. I will check on him tomorrow. And take some photos of the little boofa! There were no photos through this whole scenario as I was kinda busy, and well, covered in… the kind of stuff you get covered in when you are delivering a calf. So now, we have two heifer calves, and two bull calves. Next week – tagging them all and turning the boys into steer calves. A pity HB was pregnant to her own father – I am not going to line breed (aka inbreed) cos he’s a fine looking little bull. Figgy’s bull calf is more of a delicate looking little fellow. This one is a serious macho guy. Hotblack’s Boofa bull is to be called Jose, Figgy’s bull calf is Jorge, and two more ‘J’ names for heifers to think of before tagging them this week! This entry was posted in Cattle, Farm and tagged Calves, Cows. Bookmark the permalink.